Bill Cooke GW0ION silent key aged 96. 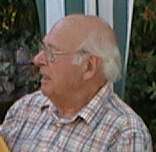 I have just heard the sad news from his son, Nick, that Bill Cooke GW0ION, past Chief Engineer and Managing Director of Eddystone Radio Limited has passed away today very peacefully aged 96, at home in Newport, Wales. Eddystone was, of course, a hugely important part of his life and Nick reports that a photo of the factory was on the wall above his bed. Nick will let me know details of the funeral arrangements when known. Bill’s wrote about his life in the “Cooke Report” which can be downloaded from the History section of this website.. Bet you would like these under your pillow! We are grateful to Dave for sending us pictures of his pair of Eddystone pillow loudspeakers made by Eddystone in the 1950’s. 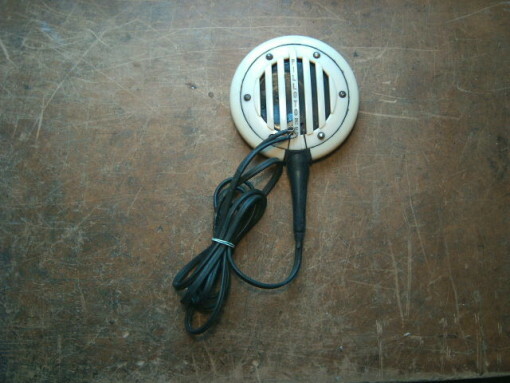 Graeme G3GGL (SK) described them in the QRG as follows; “A flat , smooth, bakelite grille, approx. 4” dia. by 1” thick. “When slipped under a pillow, speech and music can be heard clearly by a resting person but will not be audible to other occupants of the room.” circa.1950. Original price £3 14s 3d including matching transformer, flex and plug. Advertised on the back of the instruction manual for the Model 670. Extremely rare. “. 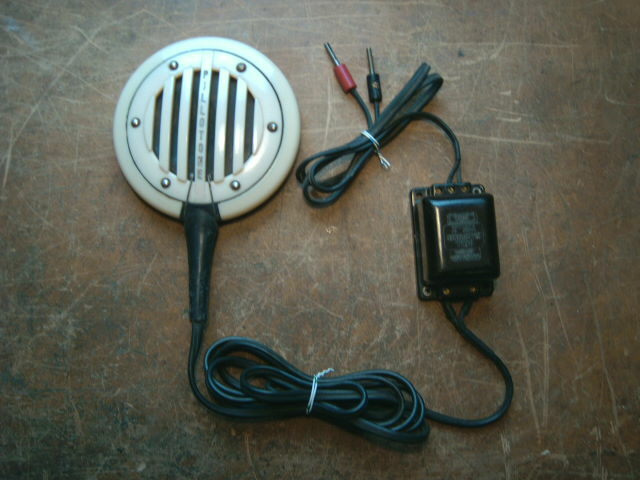 Dave says that they were made for Eddystone by ACOS who made crystal gramophone pick-ups & microphones in the 50’s & 60’s. They are high impedance so he thinks they are also crystal. The small brown Bakelite box is the transformer of which he only has one. Primary has 3 taps to match radio’s speaker impedance, the secondary only one winding for pillow speaker. They have PILLOTONE on the front as in the Brochure etc. All the wiring is rubber insulated. 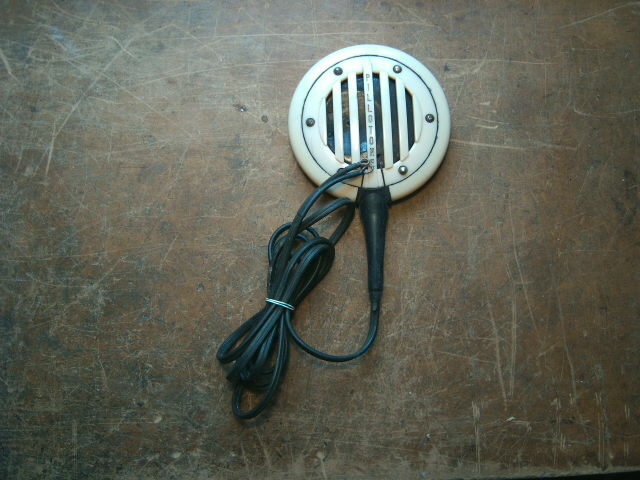 They were sold as Eddystone Accessory Model 1419. 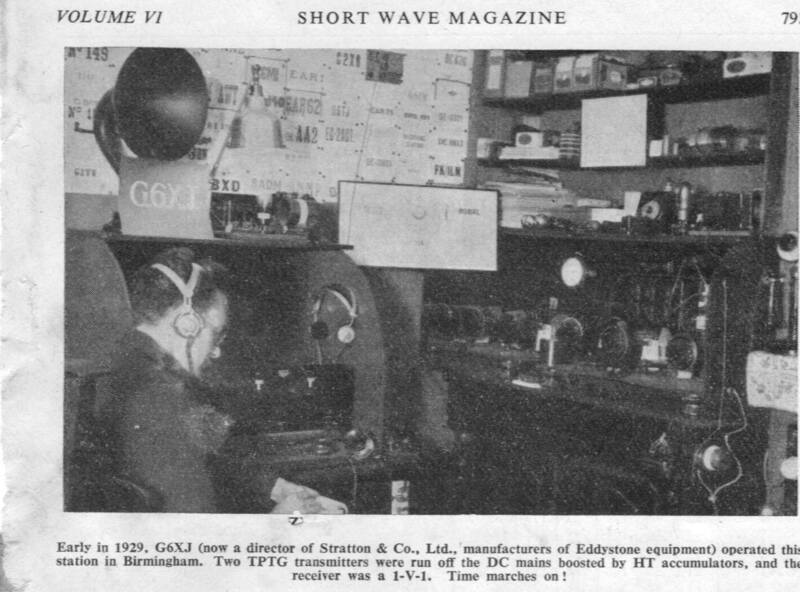 Matt Twyman GW6KOA who used to be a test engineer at Eddystone in the 1980’s and 90’s (working on 1650 Receivers as I recall) sent me a page from an old Shortwave Magazine of January 1949 which showed Arthur Edwards G6XJ operating his station in 1929. Arthur Edwards was the Sales Director for Strattons for many years from its early days until the early 60’s before it was sold to Marconi. You may recall a recent news item regarding whether there really was an Eddystone Television. This had been triggered by an E bay auction of a dealers sign which indicated that they sold Eddystone Shortwave and Television apparatus. The sign, with a starting price of £200 failed to get any offers on E bay. Last week I noticed that the same sign had been put in a Chippenham Auction Rooms auction of Toys, Enamel signs and Packaging which was held on Friday 27th November. The estimate in the catalogue was £300 to £400 but again it failed to meet its reserve and was passed over. I wonder where it will turn up next. Still not sure if Eddystone ever made and sold TV sets by the way!. Interesting story from John KA5QEP on the EUG forum this week. Apparently several times a year the ARRL, who are the national amateur group in the US, runs a frequency measuring test. Signals are broadcast on three ham bands and hams are invited to measure the exact frequency and send them in. After the contest, the results are given. 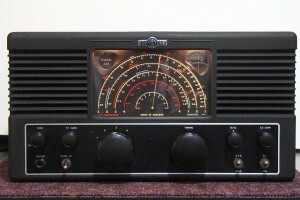 This time the emphasis was on vintage receivers, so John used his Eddystone EC958/3. He only used the frequencies as read from the dials after calibrating the BFO and fine tuning controls to give a zero beat at the nearest 10 KHz calibration point, and then zero beat the signal. He didn’t use counters or signal generators. 80 Meters: 3598.1KHz, accurate frequency was 3598.13122. I was off by -31 Hz. 40 Meters: No signal was heard. 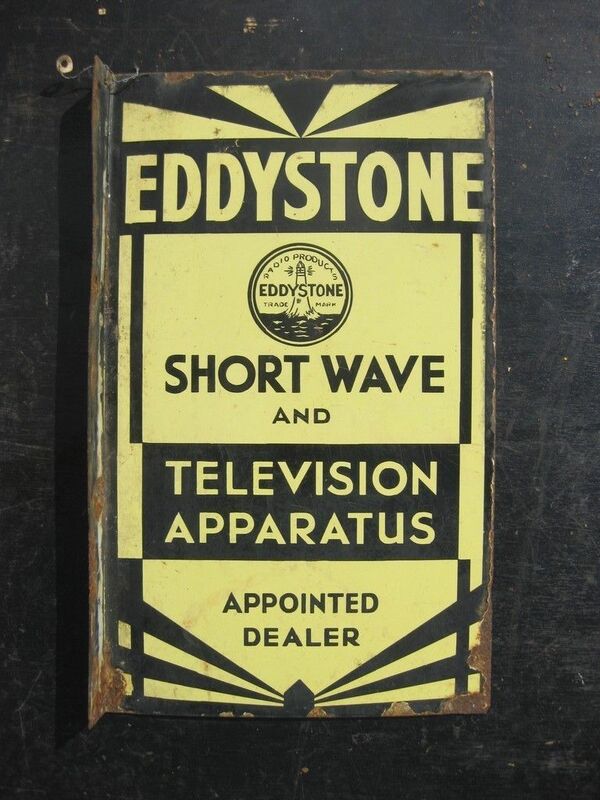 Was there ever an Eddystone television? Eddystone Dealers sign with TV reference? 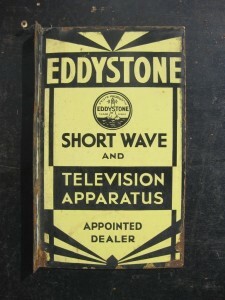 A recent E-bay offer of a dealer’s sign advertising Eddystone Shortwave Sets and Television Apparatus, raised the old question of the televisions that Eddystone were supposed to have made in the 1950’s. Despite requests in the Eddystone User Group newsletter over the years nothing of substance was ever discovered about these sets which were supposed to be consoles. It was my impression from speaking to Bill Cooke in the 1980s that these were prototypes made and used by the directors and never put on the market. This is somewhat contradicted by the dealer’s sign but there is no record of any Traders Information on the set as you would expect from a commercial product. I can also find no reference to a television set in the BP register (register of all top level drawings or “ blueprints”). There was a suggestion that they were projection type sets, as an ex Merchant Navy Chief Steward told Ted Moore that he recalls seeing an Eddystone projection console on a P&O ship that was very difficult to install and set up but again no firm evidence. I also cannot see any reference to televisions in Bill’s autobiography “The Cooke Report” which can be downloaded from this site. A real mystery, will we ever know the facts? This Eddystone S740 which had been beautifully restored by its owner sold for a fantastic £176 on e Bay recently. The vendor gave a good and honest description of the set and included plenty of pictures which is just the right way to go about getting the best price. The vendor said that when he got it, it was working reasonably well, though dusty and with some cabinet marks. Apparently electrically it was not far off, and just the usual capacitor and resistor replacements brought it up to spec. In fact he needed to replace far fewer capacitors than the later Eddystones he had repaired. Through the Eddystone User Group and courtesy of Ian Nutt who had reproductions made; he was able to replace the tuning spindle and bush so the tuning is really smooth. He gave the cabinet a clean up and a very light matt black spray to restore the original look but without hiding the wrinkle finish. The performance was fine for what the vendor used it for – mainly local broadcast (using a 4 ft wire as antenna!). but he said it will resolve SSB with a bit of work getting the RF gain setting right so that the BFO can do its job. He also added a modern IEC mains connector with built in filter and a mains fuse. 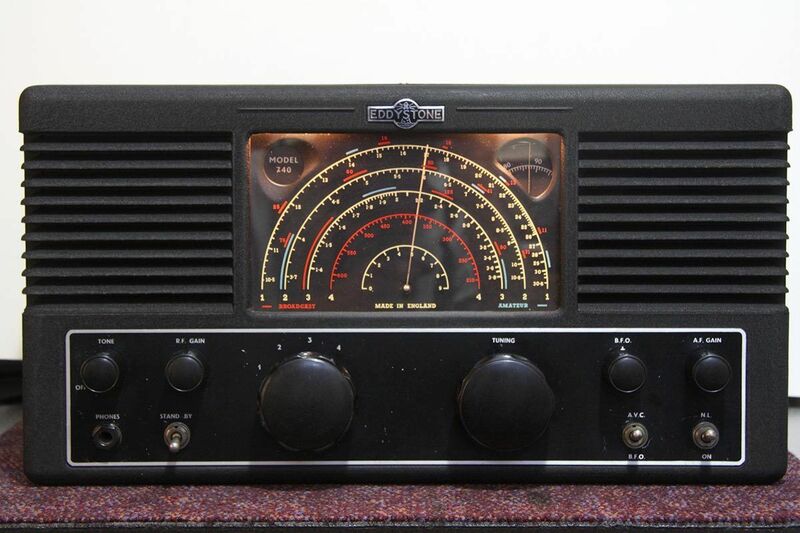 The Eddystone S740 was a general coverage communications receiver; AC Mains 110-250v; 8 valves 1 RF; 1 IF (450kc/s); BFO; required external speaker and had provision for plug-in S-meter; (both optional. It covered 4 bands: 1.4 to 30.6MHz According to Graeme’s QRG research the production run was only 900 sets, which made it rather rare and the original price was £32. 10s. 0d.